I was born June 28, 1926. My folks named me Gene Leroy Quint. My Dad's name is Louis Elmer Quint. My mother's maiden name was Geniveva Marie Morris. She signs her name Veva M. Quint now. I was born on a farm four miles south and 2 1/2 miles west of Hill City, Kansas. I was delivered (I'm told) by Dr. J. A. Bundy. I started to school in a country school called "Sunrise". It was located 2 1/2 miles from my home. I remember it was a long walk. In stormy weather the folks would take me back and forth but on nice days I would walk. I went to this school through the third grade. About 1933 the 'dust bowl' days started. In the spring of 1934 Dad went to Gooding, Idaho to find work. The crops were all dusted out in Kansas. Later in the spring, Mom and I got on the train at Wakeeney and joined him. I had gotten the measles the day before Mom and I boarded the train. We left in a duststorm. We arrived early the morning. The sun was shinning and the air was so clean after all the dust. The Northwest is big, beautiful and still has much fresh air. We came back from Idaho that fall. We lived in Hill City that winter so I started to school there and continued on through High School there. In about 1939 Dad bought his first farm tractor, a 1930 Wallis. I'm not sure of this date, but in 1942 he traded the first tractor for a new Minneapolis Moline. I was old enough to be able to have had the experience of working the fields with horses. I still enjoy riding and watching the big, good draft horses work, but am thankful that I don't have to use them on the farm these days. On December 6, 1944 I left Hill City on a bus to go to Denver to be inducted into the Army. I remember that trip very well. It was very cold and I rode that cold bus all night. I was a pretty lonely boy that night! The next day, December 7th, I was sworn in. By January the first I was in California taking Infantry Training. They told us we walked one hundred miles a week, and I don't believe that was exaggerated. The last hike in basic training wa twenty five miles, carrying a full pack which with rifle and helmet weighed forty pounds. I came home for ten days then reported at Camp Howie, Texas. I boarded the train at a camp in Maryland, was issued new equipment and was ready to ship out to Europe. Congress passed a law that 18 and 19 year-olds were to receive six weeks advance training before going into combat, and also the war had ended in Europe, so I was called back, went to Howie, Texas for more training then went to Fort Ord, California. By this time the war was officially over in Japan. I went over anyway, joined my outfit, the 24th Infantry Division on Mindenowa in the Philippines. I wound up in the occupation army in Southern Japan. I also was a truck driver rather than a foot soldier. I was sent to haul supplies for a missionary in Hiroshima. This work lasted probably two weeks. During that time I saw the destruction of the Atomic Bomb. The destruction was very great. I came home in the fall of 1946 and was mustered out in November. 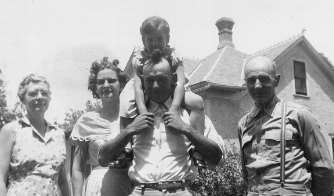 I came back to Kansas and to farm on my own with help from my folks and my Uncle Perry Loyd. Uncle Perry had 320 acres of very good land that he rented to me. Prices high and the weather was kind, and I began to ge a good start farming. I decided I could make more money the quickest on the farm with sheep. So I got into the sheep business. I farmed wheat and did some custom trucking during the years. In August 1949 I married JoAnn Blackman. We moved onto her Grand-dad Staggers farm in the spring of 1950. It is located about 2 miles west of where I was born. JoAnn was born in Hill City, Kansas. On July 11, 1950 Charlotte was born at Hays, Kansas. The trip over there was pretty long for me. It was at night, naturally, also very foggy. In 1952, I think, we moved down to my home place where we ran sheep. It got dry in the '50's, I got discouraged and sold out in 1956. In March of 1955, Carl was born, then in July 1956 Vera was born. In January 1957 we headed back to Idaho, I had purchased a farm at Caldwell. It was irrigation; I raised grain, alfalfa and corn. I milked a few cows and ran some sheep there. During that time I think I worked the hardest that I have before or since. I sold this farm (120 acres) in the fall or late summer in 1960. We came back to Hill City. In October, Earl was born. We rented the Staggers farm again. While in Idaho I had the privilege of hunting deer and elk and in fishing in the wilderness of the area. I visited a sheep spread out in the desert (Owyhee) and traveled into central Idaho also Oregon and Washington. The Willamette Valley really took my eye. This valley is in Oregon. In fact, I tried to buy a ranch at Eugene, Oregon, but I couldn't get enough money fast enough so this ranch sold to someone else. We have made trips back to the northwest to visit - it is a great country. Since I have come back to Kansas I have bought some land, have rented more and now I operate about 2,000 acres. Most of this is grass. I have built my cow herd up to 180 to 200 head and will plant about 300 acres of wheat this fall (1969). I hope to keep farming, get my kids as good an education as they want, then maybe not starve in my old age.